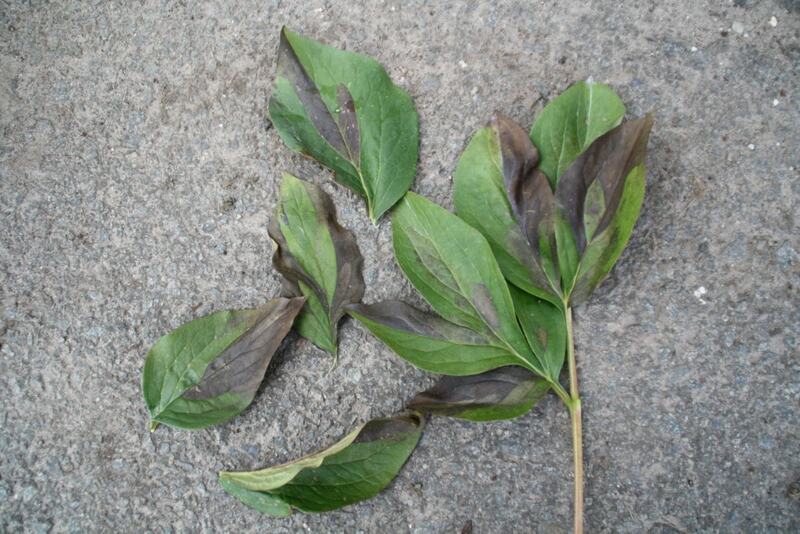 Hurtekant, K. “Foliar Nematodes in Peonies.” In: The American Peony Society Bulletin, March 2014, no. 369, pp. 20-27. Several leaves from Old Faithful, all infected with Aphelenchoides fragariae (strawberry leaf nematode). Nematodes, very small eelworms (roundworms), live in the ground or in plant tissue and are omnipresent, several millions of them live in every square metre of soil. Most are harmless, but some are not. A well-known harmful nematode amongst peony growers is the root knot nematode (Meloidogyne hapla). 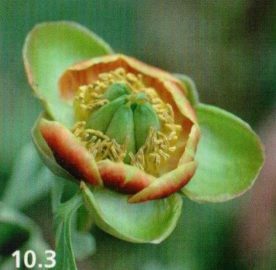 In earlier articles of the Paeonia Bulletin, you can find descriptions of this pest and I will therefore not elaborate on it. What I do want to write about is a less well-known nematode species, Aphelenchoides fragariae (Strawberry Leaf Nematode). 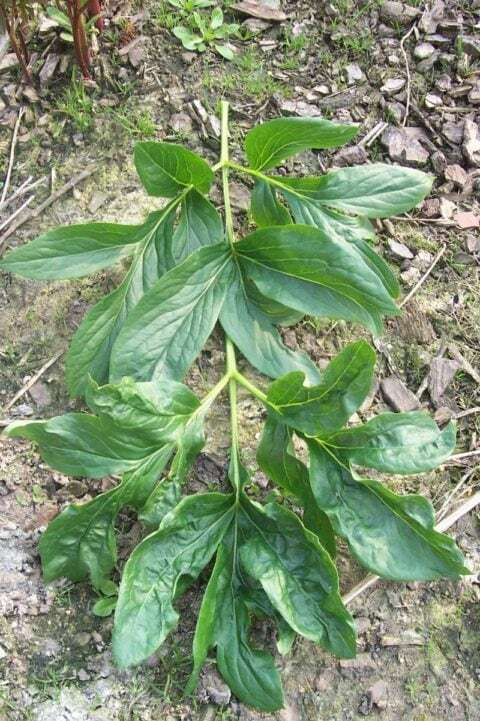 This is a foliar nematode that feeds on the foliage and buds of several plants of which paeonia is one. 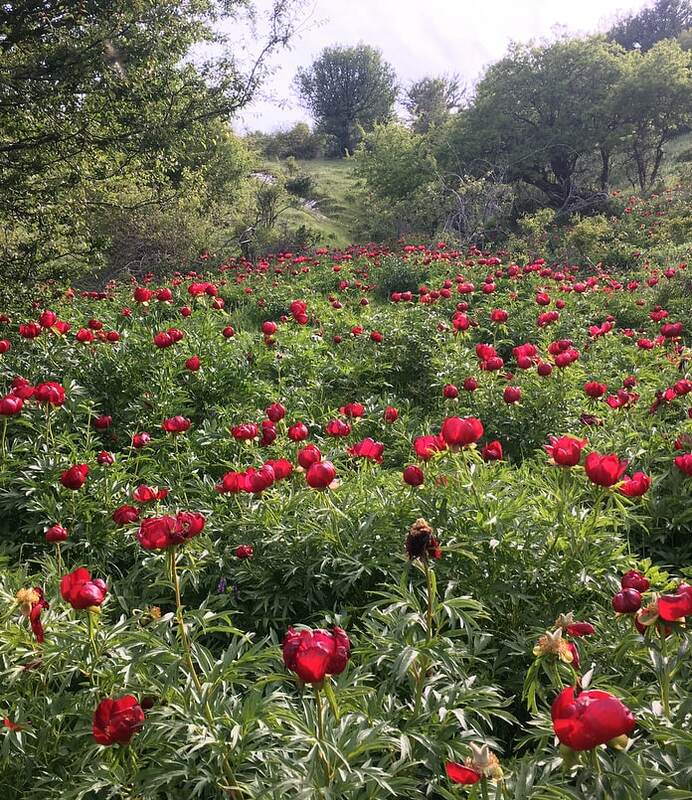 There are other foliar nematodes (A. ritzemabosi is another widespread one), but these do not infest peonies, thus are of no concern here. 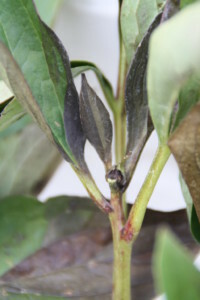 Dried up bud, due to foliar nematodes. From these infected buds, the nematodes will slowly infect the rest of the plant downwards. When the foliage is wet, the nematodes come out and either swim towards other leaves, or simply ‘jump’ trough dispersing raindrops towards other plants. Leaf nematodes are very small, some 0.45 to 0.80 mm long and thickness only a small fraction of this, they are thus invisible to the naked eye. You can easily look up an elarged picture of it on the web. They can survive in soil itself, but only for a short period of a few months. They can survive in dead tissue (dried leaves and stems) for up to 3 years and in a living peony they will simply never go away. In a living peony they survive in the buds, not in the roots, during Winter and then move along with the flower bud as the shoot develops. From there they then move to the foliage below the flower bud. This happens when it rains or when the foliage is damp (dew) as they move out to the surface of the foliage and ‘swim’ around to other parts where they enter the foliage again through the stomata (leaf pores), mostly at the underside of the leaves. They move to other plants through droplets of water or through contact of infected leaves with healthy ones. They also travel to other plants through weed leaves and seeds. Some nematodes remain in the smaller buds that will only grow the following year. They can multiply exceptionally fast, on average 32 eggs per female and at 18°C only ten days are needed per cyclus (from egg to reproductive maturity). At this speed several thousands of nematodes can be produced per gram of leaf within a time-span of only two months. One leaf can easily contain up to 60,000 nematodes when heavily infested. There are numerous other plants that can be hosts for them, ferns, phlox and hosta are well-known examples, but also several widespread weeds like groundsel. Old Faithful, leaf with dead tissue due to foliar nematodes. Nematodes have difficulty passing the veins, so dead tissue usually stops there. 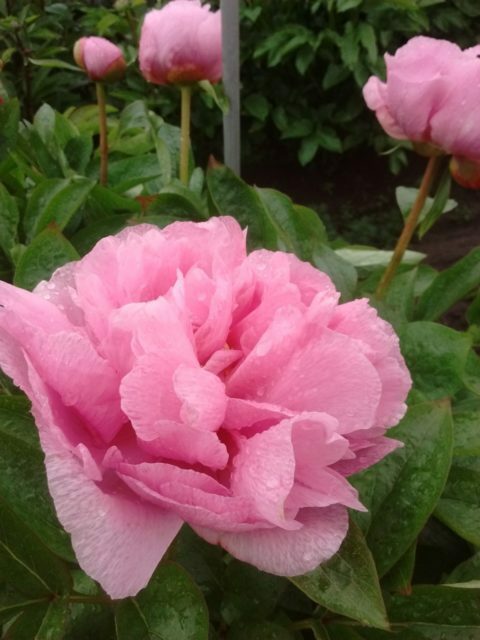 When a peony is infested with leaf nematodes this shows first in some buds drying up or giving deformed flowers. However, this can be caused by a simple fungus like botrytis as well. But botrytis will attack the buds from the outside and then move on inwards, whereas the foliar nematodes work the other way around, so when the outside is still healthy but the bud doesn’t seem to grow, cut through this bud and when the inside has rotted, you know the culprit. Another symptom is deformed foliage, although this doesn’t show in all varieties. Take a look at some pictures of Coral Sunset foliage that show this rather well. After flowering, closer to the end of Summer, the most tell-tale symptom shows: browning of the foliage stopping at the veins (the nematodes cannot move through these when inside the foliage and have to wait for rain or damp weather to come out and cross them). Take a close look again at some of the pictures of infested Old Faithful where you can clearly see this. 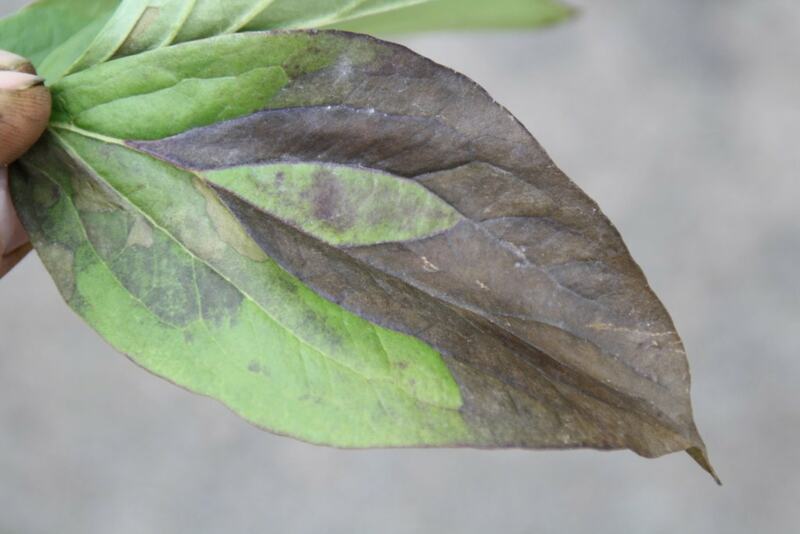 It’s the stopping at the veins that is the main clue (when the foliage turns brown in large spots that are not delimited by the veins, it’s usually botrytis or another fungus again, which is not unusual). Coral Sunset. Early in the season the signs are deformed and crinkled foliage. Below infected foliage and above healthy foliage. Preventive measures to control these foliar nematodes are the following. 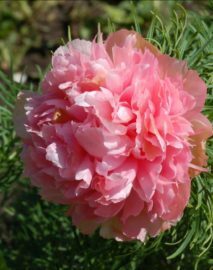 -plant peonies that have received a hot-water-treatment (see further). When you do have infested plants and you want to keep them, there’s in fact little you can do to heal them. There have been tests with chemical sprays or biological ones, but none seems to be a perfect solution. Abamectin (Avid, Vertimec), Oxamyl (Vydate), Azadirachtin (Neemazal), Imidacloprid (Admire), Methiocarb (Mesurol), Ethoprofos (Mocap), Diazinon, Metam-natrium (Monam), Burkholderia cepacia, Syzygium aromaticum, Peroxyacetic acid (Zero-Tol), Trichlorfon have all been tested and several showed some reduction in the leaf nematode population.4 However, only a few of these are really worth the effort: Abamectin, Oxamyl, Diazinon and Peroxyacetic acid. But none give perfect control because at the end of the growing season the new buds have high populations of leaf nematodes again. It’s obviously very difficult to target leaf nematodes that are already present in small buds that will not grow this season but only the next. Next to that the nematodes live within the foliage, not on the surface of it. 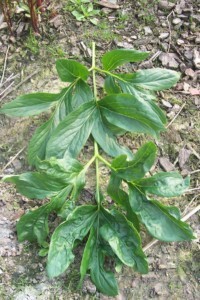 As peonies do have rather thick leaves, the chemicals cannot easily reach them. Either spraying needs to be done when the foliage is wet and the nematodes move around (although they will never do this all at the same time) or the chemical has to be systemic, moving through the plant itself. Another problem is that not all chemicals have a registered formulation everywhere. Oxamyl (a systemic chemical available here under the trade name Vydate) only has a granular formulation in the Netherlands and must thus be soaked into the ground before the plants start growing or at the beginning of the growing season. This was one of the best products in a comparison of different chemicals there, but still gave no perfect control. Here in Belgium Oxamyl is available as a liquid formulation as well that can be used as a spray during the growing season itself. According to the label, three sprays following shortly one after the other should be effective. I duly tested this and indeed after three sprays (after flowering) this year no single living leaf nematode was found in the foliage of my heavily infested Coral Sunset and the browning between the veins of the foliage has not returned for the first time. It remains to be seen whether the ‘sleeping buds’ are healthy however, but another round of three consecutive sprays shortly after the growing season begins next year will show if I do get the same proportion of flowers lost or not. I will gladly report on the results next season. However, in the long run it would be great if there were some effective curative biological control as chemicals are more or less unhealthy and their use may be further restricted. The biological extracts above (Azadirachtin (from the Neem tree), Burkholderia Cepacia (a bacteria), Syzygium aromaticum (cloves)) are no match for the nematode population. From personal contacts I have been informed that garlic extract could put off foliar nematodes, although I have not found anything about this statement anywhere else. It deserves a trial at least. Another as yet untested cure could be a hot water drench where one drenches water of 90°C (195°F) over the plants in the field. This has been tested in hosta and ferns.5 Since peonies are usually planted with very little soil above it and have no foliage in Winter, it might be a good way to kill off the nematodes present in the buds close to the surface. It remains to be seen whether it will work and whether the plants themselves will tolerate this. The best solution so far is still preventive: a hot-water-treatment. This means the roots are kept for some time in hot water which kills the nematodes but spares the plants. The temperature and duration are very important here as too hot may as well kill the roots themselves and too short or too cold may mean not all nematodes are dead. The usual way to do this is as follows.6 First you put the peony roots in water which has a temperature of some 25°C (75°F), then you heat up the water until it reaches 43.5°C (110°F). You keep the water at this temperature for at least an hour and at most two hours (larger roots take somewhat longer than small ones to reach the required temperature, thus best to give larger roots the longer treatment). Then immediately the plants must be removed from the water and cooled down very fast either by putting the whole lot of them in cold water for an hour or so, or continually spraying them with cold water until they have cooled off sufficiently. It’s also a good idea to disinfect them afterwards with a fungicide like Thiram. Do not cool them back immediately for longer storage just above freezing, better to plant them immediately or if not possible keep them for some time at temperatures around 10 to 15°C (50 to 60°F), only gradually cooling them down over the following weeks then. A lower water temperature and shorter duration are insufficient to kill all leaf nematodes. If the water is kept at 45°C (113°F), root knot nematodes will also be killed. But still higher temperatures above 45°C will damage the roots.7 To keep water at such constant temperature, one will have to heat up a large amount of water where temperature rises and drops happen only very gradually, and keep the water moving around. In the Netherlands this is usually outsourced: some professional companies do this hot-water-treatment for the growers. Special machinery is made for this.8 The hot-water-treatment is given after harvest of the roots, thus usually September, October and November in the Northern Hemisphere. From December onwards chances of damage are higher, especially in hybrids that seem to tolerate the hot-water-treatment less easily (a phenomenon I have noticed personally, Soft Salmon Saucer, Sunny Girl, Old Faithful, Coral Sunset were severely damaged up to the point where they never grew again). Many growers know that roots of some hybrid varieties are more difficult to store over Winter, it is my opinion these are also the ones that are most susceptible to damage from the hot-water-treatment. 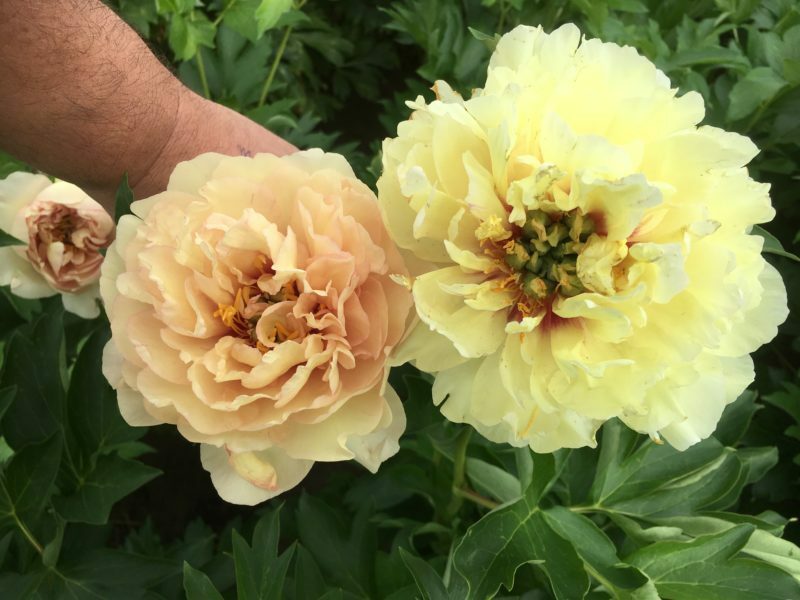 Most research on hot-water-treatment of peonies has focused on lactifloras and a few officinalis cultivars, I know of no trials with hybrids of other ancestry. Lactiflora varieties definitely take it more easily. Thus, to work with hybrids I would advise: keeping them for a few days at a higher temperature, maybe 15-25°C (60-75°F)9, treating them soon after harvest and at only 43.5°C for an hour, cooling them off very fast after this and, if possible, planting them immediately (within a few days). The hot-water-treatment is standard practice in the Netherlands and has thus been sufficiently tested to say it is a safe way to get rid of leaf nematodes. It is not easy to contain this pest, but it is not impossible at least. 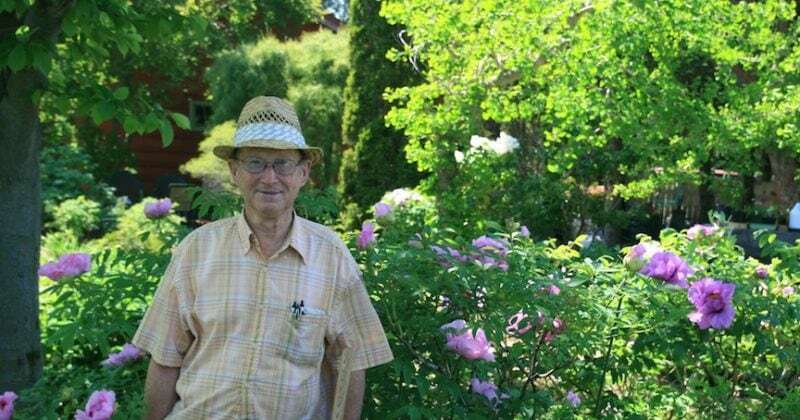 The author hopes that other growers will share their experiences so that we may all learn from one another. Any remarks about this article are greatly appreciated as well. Addendum to the article about leaf nematodes. 1 Van Kruistum, G., Hoek, H., Verschoor, J. & L. Molendijk. “Controlled Atmosphere Temperature Treatment as sustainable alternative to control strawberry tarsonemid mites and plant parasitic nematodes in strawberry plants. 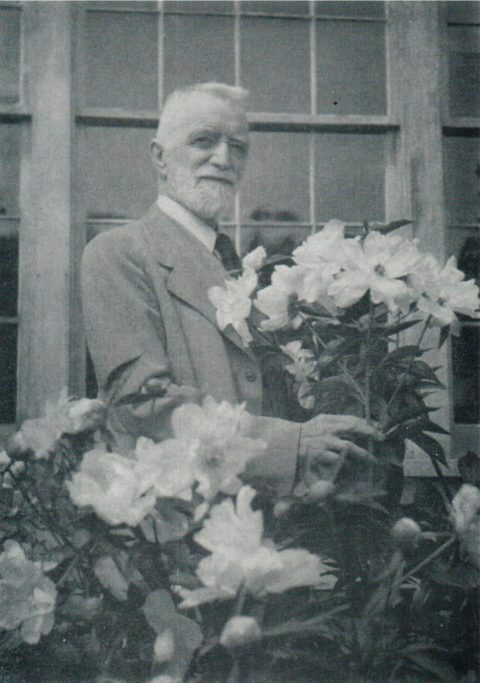 In: Acta Horticulturae (ISHS), 2012, vol 926, pp. 601-608. 1 Vegter, B. “Explosie van bladaaltjes in snijpioen kost miljoenen.” In: Vakblad voor de bloemisterij, 2011, nr 29, pp. 34-35. 2 Saathof, W. “Bladaaltjesbestrijding in pioen vergt breed pakket maatregelen.” In: Bloembollenvisie, 2013, October 18th, pp. 22-23. In: Pest Management Science, 2002, vol 58, nr 5, pp. 451-458. In: Journal of Nematology, 1999, vol 31, nr 4S, pp. 644-649. In: Journal of Nematology, 2004, vol 36, nr 1 (March), pp. 49-53. 6 Van den Berg, H. & P. Van Dalfsen. “Warmwaterbehandeling vaste planten.” PPO: Wageningen, 2003, 17 p.
In: Wister, JC. “The Peonies.” American Peony Society: Hopkins MN, 1995, p. 130. 9 A higher pre-soak temperature is sometimes used with other plants (lilies for example) to reduce damage, it has not been tested with peonies but I assume this will work with them as well. khurtekant 1 year, 6 months ago.